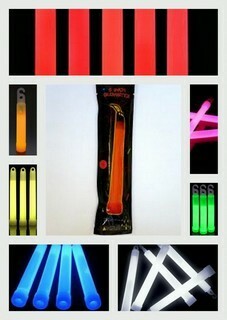 Glow Sticks for Glow Events, Night Event and Safety applications. Glow sticks with a base, hook and hanging ribbon. Size: 150mm length x 15mm thick). The total length is 6 inches so actual glowing portion is about 5 inches. Individually packaged in attractive printed packaging. Expected glow time in normal conditions (temp = 23oC) is 12 hours. This time reduces at higher temperatures and increases at lower temperatures.